Racing at RANDWICK with windy conditions, coupled with fine weather in Sydney of late, meaning a penetrometer reading of 4.89, hence looking at a dry GOOD (3) surface. RAIL: +3M (ENTIRE CIRCUIT). We head to RANDWICK with the rail out +3M. Hoping for even track where all runners get their chance (pace dependant), but especially given the windy conditions, be sure to keep a close eye on early races for best guide. Race 1: We start with a feature, in the Group 2 Silver Shadow Stakes for the three year old fillies over 1200m. Small but ultra-competitive field, but think best value definitely lies with FORMALITY at $3.60+ with UBET, LUXBET and BET365. Besides failing in the Golden Slipper on a heavy track, has hardly put a foot wrong and last start before spell proved she handles the Sydney direction. Main dangers CHAMPAGNE CUDDLES and ALIZEE. Remember the money back for 2nd/3rd (up to $50) for races 1 - 4 (see banner above) so definitely extremely applicable here for additional insurance. Race 2: Next is a benchmark 89 over 2400m. We cleaned up with SAYAD last time when bolting in, and couldn’t believe the end price, but no such price on offer today. Concede will be terribly hard to beat, but does go up to 61kg and $1.60 is skinny. Instead prefer to dabble on MORE MOET @ $7+ (CENTREBET) and *FOUR CARAT* @ $23+ with UBET and CENTREBET. MORE MOET is in great form and at least comes out of a different formline, meaning hasn’t copped a major beating by SAYED in recent times, while *FOUR CARAT* does have a knack of improving significantly when down in the weights as he is here. Needs to improve many lengths to be a factor, but has in the past. At the price, happy to make a BEST LONGSHOT bet of the day. Main dangers SAYED the obvious and VASSAL. Note, no third dividend. Remember the money back for 2nd/3rd (up to $50) for races 1-4 (see banner above) so definitely extremely applicable here for additional insurance. Race 3: Class 3 Highway over the mile (1600m). Pace/tactics would prove crucial here with not a great deal of pace on paper. Will also be interesting how the wind plays as tucked away behind the leader might be the place to be, as opposed to leading and punching the breeze in certain sections of the circuit. Can’t go past ARRESTAR @ $3.40+ (UBET, BETSTAR) here who looks set to get the perfect ride in transit from barrier 1 and hopefully allow Tye Angland to peel out at the right moment in the straight and hopefully be hard to catch. Main dangers AL CUBANA, MY TAGOSON and LAST TRY WINS. Remember the money back for 2nd/3rd (up to $50) for races 1-4 (see banner above) so definitely extremely applicable here for additional insurance. Race 4: Now for a benchmark 90 over 1400m and will keep this short and sharp with the ‘best horse’ rule being activated, well at least over the shorter distance up to a mile. The runner in question is COMIN’ THROUGH @ $3.70+ (CENTREBET) who has been good to Dungeon followers in the past (Derby day at Flemington) and with Epsom ambitions this prep, should be beating these first up. As many will know, I rate LIFE LESS ORDINARY higher (another who has won for followers at double figure odds in Melbourne), but 1400m is mostly likely too short, but has trialled very impressively and I’m personally keen to follow this prep. Actually, very competitive beyond that, with most runners with claims, but hoping class prevails. Remember the money back for 2nd/3rd (up to $50) for races 1-4 (see banner above) so definitely extremely applicable here for additional insurance. Race 5: Now back to the features, this time with the Group 3 Up and Coming over 1300m for the three year olds. Hard race, many returning and several you would think with bigger fish to fry / on trial for later races (over longer distances) making a few tricking to line up. As a result, rather play a couple of odds as opposed to a standalone big play on something short. For that reason, lesser plays on both ESHTIRAAK and TOGA PICTA both at $13+ with a combination of UBET (both) and CENTREBET (ESHITRAAK). Both looking for longer, but can sprint well fresh. Open field. Hard. Race 6: First leg of the quaddie is a Group 2 Warwick Stakes, which is the return of super star WINX who will notch up her 18th straight victory. $1.14+ with CENTREBET is backable, but if you are like many and not a fan of backing $1.14 pops (it’s extremely rare) then simply sit back and enjoy. She’s is simply special. Race 7: Now for a Group 3 for the fillies and mares over 1300m and the scratching of DIXIE BLOSSOMS completely changes the complexion of this race as she looked terribly hard to beat. Competitive race, as you get with these Group events for the fillies and mares, but think best value here lies with **ZANBAGH** at $10+ with CENTREBET. Just keeps getting better this mare and what seemed once to be a staying mud lark, has now brought so many new dimensions to the fold and at the highest levels. Happy to play there on an each way basis. At the price, happy to make a BEST VALUE bet of the day and as an extra special bonus, CrownBet have agreed to extend their run 2nd/3rd and get money back in bonus bets offer to Dungeon followers for this selection also. See additional detail at the bottom of the screen, beneath the summary for further details. Main dangers IMPOSING LASS and EURO ANGEL. Race 8: Penultimate event is another Group 3, this time over 1200m and once again going with the ‘best horse’ rule and that lies squarely in the corner of OMEI SWORD at $2.50+ with BET365 and CENTREBET. Flies fresh, goes well the trip, goes well the track, and is better than these. Might need a touch of luck from the gate (1) given get back style but hopefully McEvoy will navigate his way through a field of only 8 and get going at the right time. Very even beyond her, hence it’s her or who knows?! Race 9: We finish with a benchmark 84 over 1000m and don’t see any reason to jump off **SANGIOVESE** here at $8.50+ (SPORTSBET) after she saluted for us two weeks back at double figure odds. Yes, there’s more to tackle here, but in form and don’t necessarily think there are any world-beaters here although SUPER TOO does like to tease or give the impression at times. Happy to make another BEST VALUE bet of the day, HOWEVER we are only able to nominate 1 race for the ‘money back’ CrownBet offer and as a result we have gone with Race 7 instead with Zanbagh. Main dangers SUPER TOO, GIBRALTOR GIRL and CLIPPER. Average odds $8.08+ per suggested runner! We have an exclusive CrownBet ‘Run 2nd or 3rd’ special for our BEST VALUE suggestion ZANBAGH in Race 7 at Randwick Saturday! Place a Fixed-Odds Win Bet on ZANBAGH and if the gelding finishes 2nd or 3rd, you'll receive matched Bonus Bets up to $50. *CrownBet T&Cs apply to any Bonus Bet credited. This exclusive offer only available to members of ASP Dungeon. Excludes Residents of NSW & SA. CrownBet members must place a WIN only Fixed Odds bet on ZANBAGH in Race 7 at Randwick, Saturday 19 August 2017. 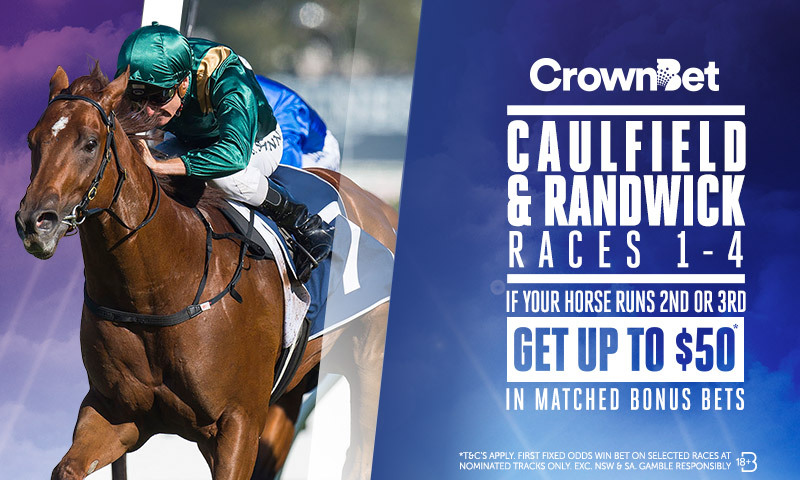 CrownBet will match your Fixed Odds Win Bet up to $50 with a Bonus Bet if ZANBAGH finishes 2nd or 3rd. 18+ Gamble Responsibly.